The tiny L88B e-cigarette is the model that many new e-smokers start with, perhaps because the L88B and its variants look just like real cigarettes. The typical L88B battery activates automatically when you puff on the e-cigarette and has a charge of about 90 mAh, which is good for around 40 puffs. Because 40 puffs won’t get most e-smokers through the day, many L88B e-cigarette kits come with multiple batteries as well as a solution for charging dead batteries when a power outlet isn’t available. While this e-cigarette has an attractive size and shape, it is probably best for social smokers. I started with e-smoking by buying an L88B e-cigarette. Although I enjoyed the e-smoking experience, I quickly found that I needed something with better vapor production to satisfy my nicotine cravings. I switched to an eGo e-cigarette and later to a VaporFi VOX II. An L88B e-cigarette may use either a three-part design consisting of a battery, atomizer and disposable cartridge or a two-part design consisting of a battery and cartomizer. The vast majority of the products in this category today use cartomizers; learn about the difference in my article comparing cartridges vs. cartomizers. A few companies are still selling L88B e-cigarettes with disposable cartridges, and I strongly recommend against buying them because they just don’t work well at all. Cartomizers — cartridges of liquid with built-in heating coils — cost a little more but are much more reliable. Cartomizers designed for the L88B e-cigarette hold about .8 ml of liquid, which is a bit less than the 1 ml that cartomizers designed for the 510 e-cigarette can hold. You can also use an L88B e-cigarette for dripping by purchasing a drip tip made for L88B or 306 atomizers. However, you have to be careful with this; every L88B battery I’ve ever seen was an automatic battery with an airflow hole in the atomizer connection. You can just make out the hole in the picture above. If you drip with an automatic battery, you risk getting e-liquid in that hole, which will eventually ruin the battery. Better to buy an e-cigarette designed for dripping such as the eGo or stick with cartomizers. Most L88B e-cigarettes include white or black batteries. The primary reason for buying the L88B e-cigarette is its size and price; it is the same size as a real cigarette and only slightly heavier, making it easy to store in your pocket. Also, the fact that you can buy an L88B e-cigarette kit for under $15 makes it a great introduction to e-smoking. If you’ve never used an e-cigarette before and aren’t sure how you will feel about them, you’re only out a little bit of money if you decide that e-cigarettes aren’t for you. 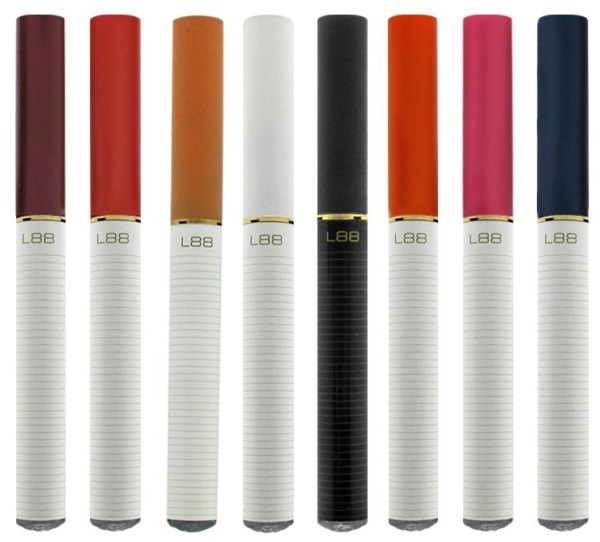 The L88B e-cigarette is also the perfect choice for social smokers, who don’t have the same need for nicotine as people who smoke a pack of cigarettes each day. On the other hand, the L88B e-cigarette doesn’t give you any room to grow. If you decide that you want to start buying your liquids by the bottle and experimenting with other liquid delivery systems such as tanks and new types of cartomizers, you’ll find that these systems are much larger than the L88B battery and look quite silly. You’ll also find that the L88B battery can’t power these other attachments reliably and doesn’t work well for dripping. Although the L88B e-cigarette is a fine choice for anyone who only smokes socially or smokes around half a pack of cigarettes per day, if you smoke more heavily you’re likely to want to upgrade before long. The two best L88B e-cigarette kits I know of are sold by Starfire Cigs and Envy. Starfire’s package has more polish; the portable charging case is very nice, and the batteries are glossy, while Envy’s are matte black. Starfire’s kit is also available in either black or white. Starfire’s liquids are made in the United States and taste much better than Envy’s, which are made in China. However, the Envy NirVana kit starts at just $14.96 with a coupon code, while the cost of entry for Starfire’s kit is a bit higher at $59.95. If you can afford the slightly higher price of the Starfire Cigs kit, I’d recommend going with that one. If you’re on a tight budget, the Envy NirVana is still a great low-cost introduction to e-smoking. 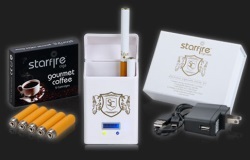 Starfire Cigs Electronic Cigarette ($59.95): Includes two batteries, portable battery charging case, USB and wall chargers and pack of five pre-filled cartomizers. Features 30-day money-back guarantee and one year warranty. Envy NirVana Economy Starter Pack ($15.96 with coupon code EnvyMe): Includes one battery, USB charger and two pre-filled cartomizers. Envy NirVana Premium Kit ($19.96 with coupon code EnvyMe): Includes one battery, portable battery charging case, USB charger, atomizer and five disposable cartridges. Last updated in November 2016: Updated article to reflect the modern e-cigarette market. Unless an e-cigarette company specifically claims that its liquids are made in the United States, you can assume that it buys its liquids from China. The largest e-cigarette liquid supplier in China is Dekang.